It is July in upstate New York. Heat and bright pressure leans down, in a dry, lazy haze that seems to have always been, and will never go away. Engulfed in the summer now, my run this morning through Forest Lawn Cemetery involved pushing through air that has seemingly been replaced by raw heat-- everywhere. In other words, I miss October. I spent part of this afternoon looking at the vast expanses of my cemetery photography, and found this album I took last October in a small cemetery in a nearby suburb which is not very far from my city, and not very far from the very rural area which surrounds us. 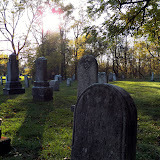 St. Paul's Lutheran Cemetery was established in 1849, by the Amana Ebenezer Society. Some background on residents of Amana settlements. A religiously-based colony of people from Germany who emigrated to the United States in the mid 1800's, the Amana communities followed a Catholic tradition, and believe in peaceful, quiet work toward one's faith and values, rather than evangelizing the Christian Bible. With these beliefs in mind, the Amana or Ebenezers lived a communal life, entirely self-sufficient, until the 1930's. First living in New York (where this burial ground lies), they later moved mainly to Iowa, and have historically been mistaken for Amish peoples. Today, their graveyard lies next door to the Mayer Brothers Cider Mill and Store, an absolute and frequent autumn destination for yours truly. The red buildings seen in these photographs are the cider mill, where each September and October pumpkins adorn the decor, and the smells of cider, apples, pies and maple syrup carry over the darkening light and into the cemetery each October. In only mere months these photos will be a year old-- but there's a certain something here, among the orange and the falling leaves between the stones-- that help pass these long, hot summer days. When it feels as if October is so far away. Can't wait till next weeks update- after the Columbus Day wekenbd I'll bet there will be plenty to blog about!